Millions of people have embraced the KonMari method of decluttering their homes. However, KonMari was developed in Japan, where people live in much smaller spaces than we Americans do, and it has been most praised for helping people reduce their wardrobes. So we decided to explore the question: Can you use the KonMari method in your garage? One of the first principles of KonMari is that you should not declutter room by room. Rather, you need to work by category. For example, you could gather all of your shoes from all parts of the house: your bedroom closet, coat closet, basement, and anywhere else they might be. Then, work through the items one by one, deciding what you can discard. How can this work for your garage? To make KonMari work, you need to focus on one category of items at a time, such as gardening supplies. (Other categories might be painting supplies, fasteners, general-use hand tools, and power tools and their accessories.) These items may be scattered around your garage, workbench, garden shed, basement, hall closet, a kitchen drawer, and even your vehicle. Just getting all of your gardening items together in one place is a useful exercise. When you picture “getting organized,” do you first think of purchasing a bunch of new shelves and storage containers? Retailers encourage this type of thinking by selling Christmas ornament bins in December and document filing systems around tax time. However, the KonMari method encourages you to focus on discarding items first. Only after you have reduced your pile to the must-keep items can you decide the best way to store them. Imagine your ideal life. Before you start discarding items, the KonMari method asks you to imagine your ideal life. Does it even include gardening, and if so, what tools do you really need for that? Be grateful, then let it go. Maybe an item was a gift that you never really liked or a hand-me-down that you do not need, but you have an emotional attachment to the giver. In this case, consider that the giver would not want you to feel burdened by their gift. Take a moment to be grateful for the item’s past service, and then let it go. Many of us have been trained not to get rid of things because they might be useful in the future. If that is holding you back from discarding an item that is not sparking joy, then try asking yourself, “If the need does actually arise in the future, could I easily borrow one or buy one used at a reasonable price?” If the answer is “yes,” then let it go. Can this work for your garage? Yes, you can apply all of these tips for the discarding process to garage items. 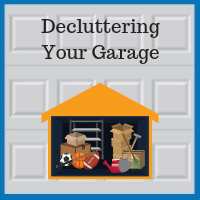 As a wise workman once said, “Take care of your tools, and they will take care of you.” By decluttering specific categories of garage supplies, you will be left with only what you need, and you will have more time to treat your remaining tools with the respect that they deserve. 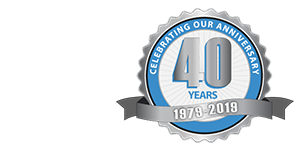 If you live in the Chicago metro area and are thinking about renovating your current garage or building a new one, talk to the custom garage designers at Blue Sky Builders in Downers Grove. Check out our list of services and some of the custom garage features we offer, then give us a call at 630-852-8485.